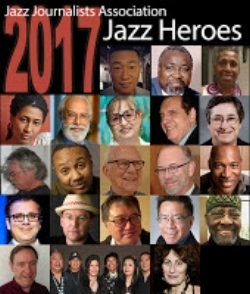 Celebrate cellist-composer-educator TOMEKA REID, the 2017 "Jazz Hero" of Chicago as organized by the Jazz Journalists Association and local contacts — one of 20 celebrations of Jazz Heroes throughout the U.S.
Join musicians and jazz enthusiasts alike for an evening filled with multi-media surprises, drinks, water, and appetizers. Chicago based cellist, composer and educator, Tomeka Reid has been described as "a remarkably versatile player," (Howard Reich, Chicago Tribune). Equally adept in classical and jazz contexts, Ms. Reid predominantly finds herself in experimental and improvisatory settings and composes for a wide range of instrumentation, from big band to chamber ensemble. Ms. Reid's music combines her love for groove along with freer concepts.